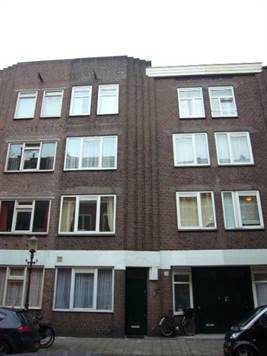 De Pijp, Amsterdam - This renovated and very modern apartment is situated on the 3rd floor with a balcony on the back. The floor is covered with a modern epoxy floor, very sophisticated and easy maintained. The loft space is divided by the very luxurious glass bathroom, which has a major rain shower, design sink and a toilet. Nice features available, like double glass windows, design bathroom, luxurious kitchen, brand new furniture, flat screen tv, washer and dryer machine and all lights in the apartment are remote controlled. The rental price is including cleaning twice a month. Lay out: entrance, living room with lots of built in cupboard space, open fully equipped kitchen, dinning area with balcony access, sleeping area which is possible to separate by a curtain from the rest of the apartment. The Pijp area is a lively area with a lot of nice restaurants and nightlife. During daytime you will enjoy the every day (except for Sundays of course) Albert Cuypmarket and of course the quietness and sun in the Sarphatipark. This area is served by tram lines: 3,4,6,7,12,16,24 and 25. Wow! This apartment is really very attractive. I think the features like The floor is covered with a modern epoxy floor, very sophisticated and easy maintained will makes this apartment more comfortable for the people who stay here. At this time I am searching for an apartment for my family. At this time I am in a work with https://waltessays.com/ sure I will contact you once I finished it.